Have you noticed the number of ‘question’ articles that dominate the BBC News home page? Have you looked at BBC top ‘trending’ article titles? Have you clicked on an article with a question as a title? Next time you visit the BBC website, take a closer look at the News home page and you’ll see just how often question article titles are written. So, the big question. Why so many? In this article I will provide my opinion on the BBC’s escalating use of clickbait. I’ll also investigate why the BBC use clickbait, providing evidence to back up my opinion. Does the use of clickbait mean that the BBC are ‘dumbing down’? – Or are they trying to balance the variety, diversity and the subjects of the news stories they are covering in order to provide readers with a full spectrum of news from around the world? This screen shot shows the ‘Full Story’ section of the BBC News home page – Note the four Question titles. If you click into one of the many ‘question’ articles, you’ll usually find content with real substance. Obviously it’s, in many cases, journalistically neutered by the BBC neutrality. But the content, energy, style and newsworthiness are there. And I’m talking about accuracy, relevancy and trustworthy content, not ‘fake news’. So, are the article titles merely playing to the natural curiosity of people from a journalistic perspective, or are they engendered with an alternative motive? The regular BBC readers amongst us will, no doubt, have seen through the ‘question’ masquerade. And in my opinion, good BBC journalism shouldn’t have to rely on cheap marketing tricks to ‘buy’ clicks. From a business perspective using clickbait as a marketing strategy works, and it can work exceptionally well. Especially if you happen to run a website as large as the BBC’s, with such a wide and varied audience, which also happens to be worldwide. The other compelling reason why, are the ‘raw statistics’. 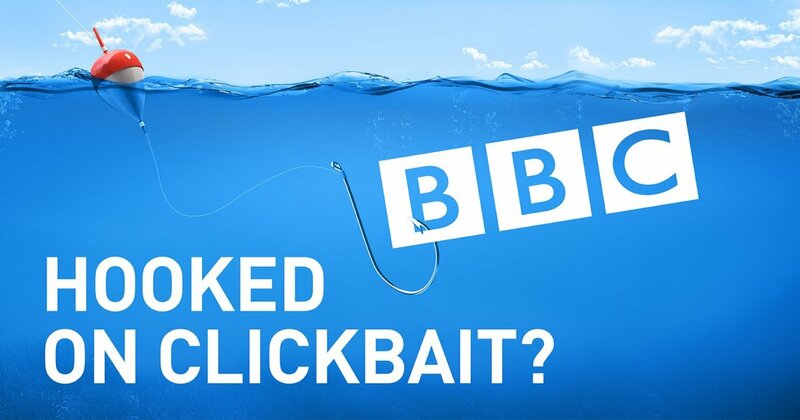 The statistics and trends identified by BBC analysts show just how powerful ‘clickbait’ is. 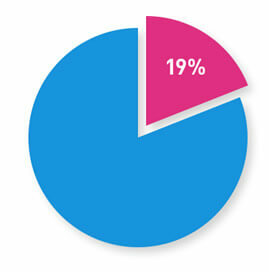 The more visitors, clicks and shares, the easier it is to sell adverting space – diversifying revenue streams! Not that the BBC sell adverting, do they? It just so happens that I’m not the only one to have spotted the trend. Media regulator Ofcom are set to investigate how the BBC are “adapting to the changing news environment”. They will also analyse whether the BBC remains trusted by audiences. Their report is due to be published late 2019. I found an article titled “Clickbait: The changing face of online journalism” it was published on the BBC website 14 September 2015. To quote “Headline writing has long been considered a skill but, in the digital age, a new word has become synonymous with online journalism - clickbait. Put simply, it is a headline which tempts the reader to click on the link to the story. But the name is used pejoratively to describe headlines which are sensationalised, turn out to be adverts or are simply misleading.” Source: BBC News Wales, Ben Frampton. Remember that question that I posed earlier in this article: Are the BBC using clickbait because of the need to follow digital trends to maintain market share and traffic momentum? The answer is again, yes. But you may not be aware of one of the lesser known reasons as to why the BBC use clickbait. It is because the BBC run adverts on their websites. Have you missed them? Here is proof that the BBC are employing clickbait marketing to generate revenue, over and above the licence fees you pay. Of course, this extra revenue is spent wisely, isn’t it? Or is it spent on creating more clickbait? Perhaps it would be more wisely spent to reduce UK TV licence bills? The BBC News website and other BBC websites display adverts to readers outside the UK. 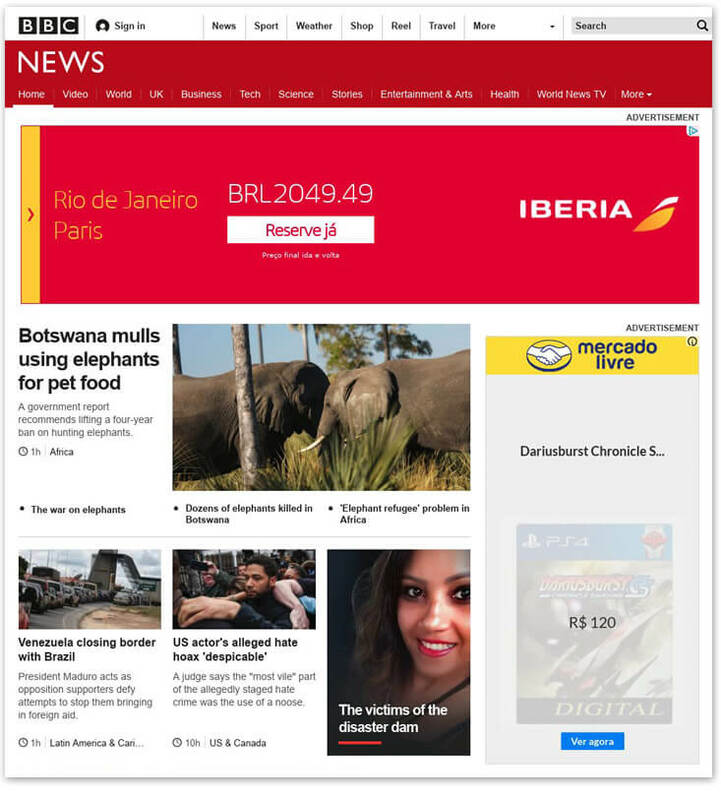 This screen shot shows two adverts displayed next to a BBC News article as viewed in Brazil. The BBC have started to take the use of clickbait even further. And, I believe, sometimes too far. I believe that article titles and images are engineered based on topics, images and content that sensationalise, and sometimes, inappropriately. The article below appeared on the BBC News home page the day that I took this screen shot. The article was ‘bumped’ off the News home page very quickly, I will leave you to make up your own opinions on the use of the title and imagery. If you look at the article title above out of context, i.e. when ‘shared’ on someone’s social media feed. All people will read is ‘Hot, disabled and not afraid to show it’ and the image that the Editor selected to head up the article will be shared along with the title. Now can you see why, in my opinion, the BBC are going too far, and placing profits and website statistics above good journalism. Again, I’m not criticising the article subject or the journalism, it’s the use of engineered clickbait on the BBC that I’m against. As a bit of an about face against my own review of the BBC’s use of clickbait, clicky, sticky content is my business. So it would be a bit two faced of me to slate BBC journalism wholesale. But I’m not slating the actual words, more so the regularity of clickbait headlines and cheap journalistic tricks that you’d expect to see on websites such as the Mail Online. Do you think there is a general dumbing down of ‘content’ on the BBC News website? – What are your thoughts? (Irony of starting and ending with a question about asking questions). Please comment on my LinkedIn profile post.